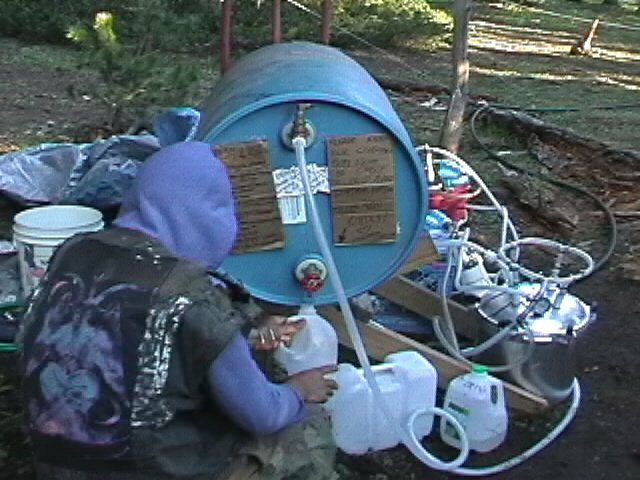 I need YOUR help to deliver CLEAN water for the National Rainbow Gathering. If you can help donate supplies, $$$, or help with moving equipment please click here for more info. Please Note this site is pretty out of date. Much has been done with filters in the last few years and I and others have many new designs. If you need more info contact me. I am still accepting donations and will get them to the right people but am looking for others to take over my role at gatherings in water filters and piping. Once upon a time, well actually 1990 at the Minnesota National Rainbow Gathering, I first got involved in supplying safe drinking water for large groups. Over the years my involvement and knowledge in obtaining, and purifying water grew. I learned how to tap and develop springs, how to use gravity to move water over long distances and finally how to filter unknown live water for safe drinking. This web page is an evolving project with references to my research in the hopes of sharing information and combining the ideas of others to increase our knowledge and ability to provide safe drinking water at Rainbow Gatherings and for home and other uses. Due to lack of time, it is not a complete listing of my research and knowledge, but a starting point with the intention of evolving. If you have ideas, information or want to share please e-mail me with more information. I am especially interested in submissions of other articles and pictures of Rainbow Water systems as well as information on taping springs, moving water and other related information. Your contributions will be added here to increase the total knowledge on providing safe, clean water. I am especially looking for pictures from past rainbow gatherings showing filter systems, the solar pumping system and articles about developing and tapping springs and moving water via gravity. I am also looking for good pictures of other versions and pieced of Wayne's filter housings. In the early days of gatherings we used to boil all our water so that we knew that it was free of Cryptosporidium, giardia and other microbiological organisms. This was a relatively effective means of providing safe water, but it required tremendous resources to accomplish. Much time was spent finding and chopping fire wood, boiling water (10 min or more at a rolling boil), cooling the water and masking the taste so that it was drinkable. While this provided safe water, it did not provide good tasting water. Iodine and chlorine were not used for two main reasons. These include peoples aversions to the use of chemicals as well as new scientific evidence that they are no longer effective in killing giardia and other organisms. Over the last few years these microbiological organisms have learned to build up a protective shell to ward off harsh chemicals. This has led to mass outbreaks of water born sickness in major cities that use chlorine for treatment recently in cities in Wisconsin and other states. City municipalities no longer use chlorine for water treatment any more for this reason. They now use a system of coagulation and filtration. These issues lead the Rainbow Family of Living Light to desire a new method of providing safe drinking water for there gatherings. 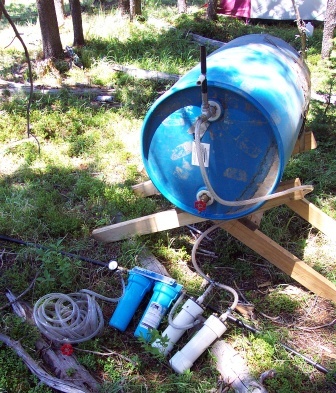 Initially we started by using Katadyn Expedition water filters. These are large, stainless steel pump style filters. While the quality of these filters was excellent the pumps were expensive and not designed to withstand the harsh environments of Rainbow. These pumps required constant maintenance and still required much work to pump enough water to feed the 20,000+ people who attend Gatherings. Nevertheless, several kitchens (including NERF, Lovin'Ovens, Bliss, Jerusalem and Info) have one of these Katadyn KFT Expedition filter pumps and plan to keep it for many years more. This is because they are quick and easy to set up with few problems for small kitchen needs. The key to keeping these pumps working well is to slowly and carefully operate the pump as well as prefilter the water with a in-line gas filter or at least a bandanna. The link above leads to a web page where replacement cartridges can be ordered for these Rainbow Standard and custom filter pumps. The #4 (also known as a 1040) filter used in these pumps is amazing in it's ability to provide clean water. It is cleanable providing long life, filters to 0.2µ absolute, and is relatively inexpensive. What we needed was a housing we could connect this filter to and use our existing gravity fed delivery system with. To the rescue came Wayne Roby robeyw@lycos.com. Wayne did the initial research and prototyping. He developed several custom systems using the #4 filter that evolved over time. I currently own two of his later generation high pressure housings. Wayne recently turned back up after not being around for several years. He has agreed to build more filter housings at a great price if there is enough interest. Email him if you are interested in new filter housings from Wayne. Wayne's designs, and those based on his research, have all performed with phenomenal results. Many times the various health department that have ascended on Rainbow have tested the water from various filter systems. Consistently the only ones that pass are those based on Wayne's filters. Most others have failed for various reasons. This is why we continue to build systems based on the #4 Katadyn filter. The current housings were suffering from a few issues and are getting old and worn out. I recently rebuilt several of them with improvements and many people have attempted new filter housing designs. Still new systems are desperately needed. Your help in designing and building new systems is crucial to continuing to provide safe drinking water to fellow gatherers! Several new systems are under development with mixed success. Right now we have built and tested (at the 2003 and 2004 Rainbow Gatherings) three main new systems. One is a small system good for a medium sized kitchen based on modifying an Omni OB1 home house filter housing with a 0.2micron Katadyn water filter cartridge. This system uses either a TO1-DS 2 micron carbon impregnated pleated paper or a CB1 1 micron Carbon Block pre-filter. Another System was designed by Douglas Lumgair. It is a medium sized system designed to replace the original Wayne designed system. A early sketch of it is here. The other system is designed for large kitchens or main water distribution points. It is based on drilling out an All American Model 921 pressure cooker and inserting the same Katadyn elements into it. More information about these systems is in links below or will be written when I get time. 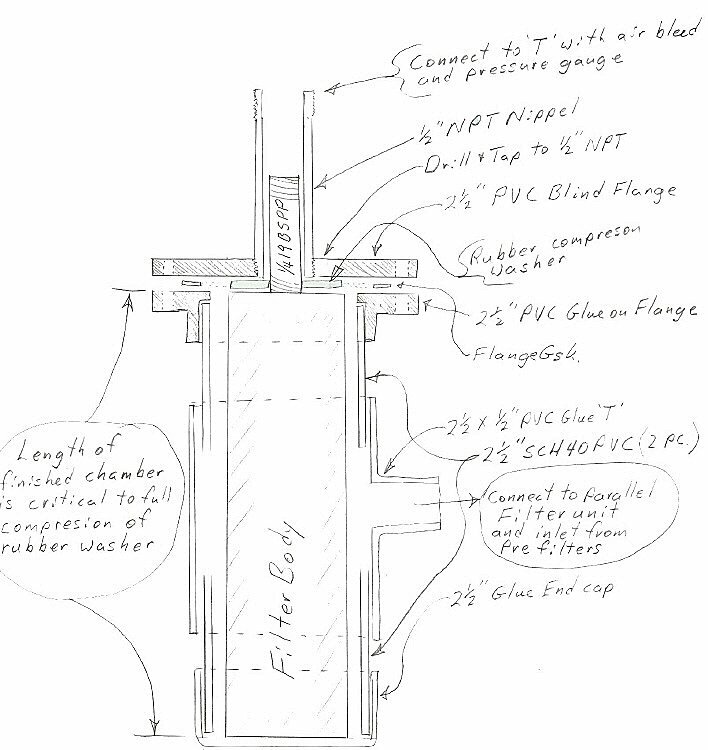 Here is a link to the original article Wayne wrote about his filter research compiled from an E-mail to me in 1996-1998. It suffers from many grammar, spelling and formatting issues. If you have time to clean it up I would appreciate the help. The following link is a dissection of one of the filter systems and an explanation of how some of the systems work. I hope people can use this to design there own filters. If you want to learn more about the filters and how they work, or want to build your own system read this. Please note: This page is VERY graphics intensive. If you have a slow Internet connection this page may be hard to view. I scaled images down to make them more readable, but there is still many pictures here. If you want more pictures, or better detail e-mail me and I can send the originals. Katadyn, Now Discontinued, Home filter catalog. http://www.dultmeier.com is a good source for pumps, tanks and such.